I always advise against customization. It is too expensive long-term, and too unstable when the environment is upgraded or moved. Instead I advocate the less-is-more approach. Make as few changes as possible to achieve your goal, and always use out-of-the-box for a while before deciding on any changes. However, in some cases it is unavoidable, and for those cases, I’ve identified a few best-practices. 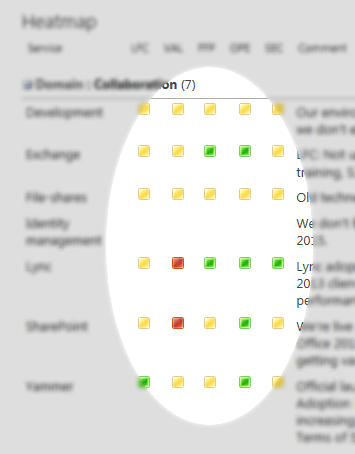 The first of these is how to create traffic lights in a list view. There are two good ways to do this. The first is a calculated column, which is already documented very well by Laura Kellogg, and the other is a custom column view using the option to add XSL-styles, which I haven’t seen shown much and that I’ll therefore give you a quick rundown of here. Both methods are very simple and only requires adding a txt-file on your site, but the XSL style has the benefit of not requiring extra columns and being a bit closer to what I believe MS intends you to do, which should make it more stable in future upgrades. The downside is that it requires a bit of XSL, which few people feel comfortable with, but with this post, I hope I can help you get around that. OPTIONAL: Create a sub-folder to this called “ListView” so you can easily differentiate your ListView style files from other custom styles you may do. NOTE: If you’re lucky the internal name makes sort of sense, but if you’re unlucky it’s some cryptic combination of underscores, letters, and numbers like “_x0069_hy3”. As far as I can tell, the “_x0069_” is a special character written as unicode, and you can learn more about those those here. Copy the code below into a new file and save in your folder. The XSL header. I have no clue what any of this means. I just copied it from someone else. 1. The Internal name of the column in my example is "_x0069_hy3", so just replace all of those with your own internal name. 4. I'm replacing the value with images that are on all SharePoint sites, but you can write your html in there if you want. Once, you’ve saved your file in the folder, make sure it’s checked-in/published, and then copy the URL. I hope this helps. If you have issues, throw me a comment, and I’ll try to help.